Co-owned Auto Appraisal Network of S. Oregon & N. Calif. for 10 years. We have appraised over 1200 vehicles including classic cars, motorhomes, trucks, tractors and motorcycles. If it moves, we can appraise it! 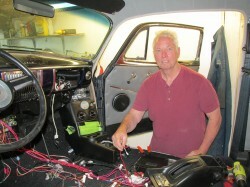 I have had an interest in cars since age 16 and have owned over 20 classic cars doing most of the work on them myself. I currently have 4 cars under restoration. I have run wholesale and retail businesses and have been in the Rogue Valley for over 35 years.